Who said you can't get performance parts for your 2010 Mustang GT ? I've just seen an awesome example of a 2010 Mustang supercharger kit from Edelbrock, called the E-Force supercharger. It is by far, the slickest looking blower I've ever seen. I'm not one to favor any particular manufacturer, and I'm not getting paid to say this, but this blower kit really is the shape of the future. Not only will kit wake up your already decently powered 2010 Mustang, it will transform it measurably and visibly! Pop the hood and this supercharger kit looks like it was an OEM design. This blower hasn't been on the market for long, and though the application information on their site says it fits from 2005 to 2009 models, I've just seen it power up a 2010 Mustang. All I can say is incredible! The kit's internals contain a 2,300 cc (yes,the displacement of an average 4 cylinder engine) Eaton GEN VI rotor assembly, which is the same unit as you'd find in a Corvette ZR-1. Its a very complete package, which includes not only the fantastic looking intake plenum and supercharger assembly, but all the other necessary parts to make your 2010 car put out a whopping 466 horsepower. Still not enough? Their top of the line supercharger kit is designed to work with highly modified engines and is capable of producing 700-800 horsepower with the right performance parts and machine work! 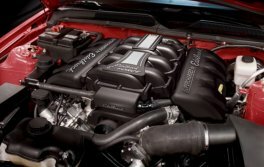 More specs and performance information for the 2010 Mustang. 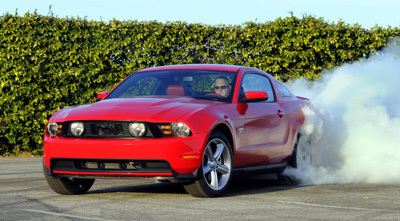 Learn about how superchargers work in the Mustang Performance section. Return to the index for: Ford Mustang ,parts,accessories and restoration information.